This chair is such a fabulous take on the Beloved Adirondack Chair, Extremely Inexpensive to Build, and a Piece of Cake To Construct! The most difficult portion of this plan is the cutting, and even that should actually be a bit of a fun challenge, nothing to difficult that you can’t tackle it easily! 1 – 1×4 at 8’ ** you can also purchase fence boards like this for savings, you will need to purchase 2 if you do this since they come in 6’ lengths and your will need to cut off the dog eared portion. 3 – 1×6 at 8’ **you can also purchase fence boards like this for big savings, you will need to purchase 5 if you do this since they come in 6’ lengths and you will need to cut off the dog eared portion. ** Cut your Front Leg Pieces out first and then rip the remaining portion ofthat board and the remaining boards into 4 1/2” widths for the Seat and Back. 8 – 1×6 (ripped down into 4 1/2” width strips) at 25” Seat and Back OR 6 – 1×6 at 25” if preferred. Cut Out your Outer Legs: You will need 2 of these exactly the same. If you have a preferred ‘side’ of your plywood, you will want to flip this template around to mirror so you have the appropriate side on the showing side. This diagram shows you how to connect the mark out the shape you need for this portion and corresponds to the angles shown in the diagram. Use your circular saw to cut this out. 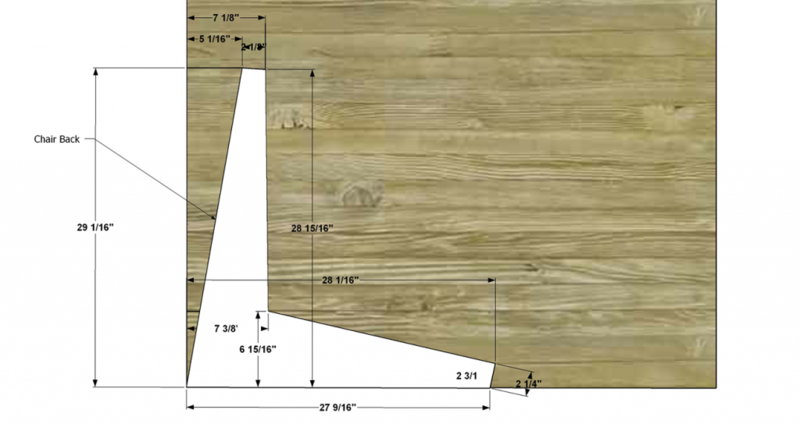 If you simply connect the dots between the dimensions outlined below and use a circular saw to make these cuts, you won’t have to worry about the actual angle for each corner. If you prefer to build this using Wood rather than plywood, I recommend creating a template using the image below, out of plywood or cardboard and then transferring that shape to your boards of choice. Cut Out your Inner Legs: You will need 2 of these, exactly the same. This diagram shows you how to connect the mark out the shape you need for this portion and corresponds to the angles shown in the diagram. Use your circular saw to cut this out. If you simply connect the dots between the dimensions outlined below and use a circular saw to make these cuts, you won’t have to worry about the actual angle for each corner. If you prefer to build this using Wood rather than plywood, I recommend creating a template using the image below, out of plywood or cardboard and then transferring that shape to your boards of choice. After you have cut out your Inner Lower Legs, you will attach them to the Outer Leg Units allowing the Bottom of the Inner Leg to be flush with the Bottom of the Outer Leg. The Top of the Inner Leg will sit 3/4” lower than the Top of the Lower portion of Outer Leg to allow for the Seat Slats later, and will sit back 3/4” from the front edge to allow for the Support Trim in a later step. The Back of the Inner Leg will extend back past the Back edge of the Outer Lower Leg and will act as the actual portion that rests on the ground. Refer to the Project Image in this step for reference as to how this lays out. Cut Out your Front Legs: This is most easily done by marking out 21” on your 1×6 or from your plywood and then a 2” width on one end and a line made between that 2” edge and the existing edge 21” up from it. Then attach to the Leg Units by fastening it from the inside using 1 1/4” Screws and glue. Attach the Support Trim: Fasten in place using 1 1/4” Screws and glue or Finish Nails, and fasten them into the Inner Lower Legs. 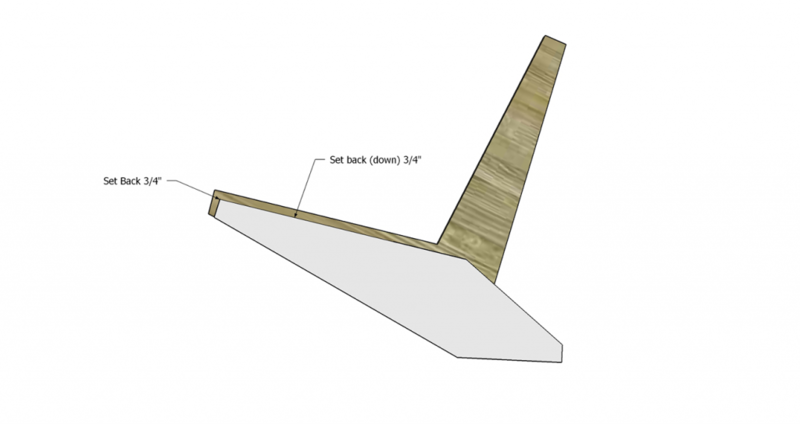 Tack on the Seat Slats: You will need to rip a 1×6 to down into a 1 x 4 1/2” panel (shave off 1” of width) to most accurately depict the original piece, (or you can cut these out of plywood) however if you aren’t able to do this I would recommend using the 1×6 in it’s original width and you will use 3 rather than 4 and space them 1 1/2” apart rather than 1”. This will look equally as nice, it just isn’t precisely the same as the original piece. Attach the Seat Slats as shown below using 1 1/4” screws and glue or galvanized nails. Attach the Back Rest Panels: You will cut a 1×6 to size (rip it into a 1 x 4 1/2) just as you did in the previous step and you will attach them to the Outer Upper Leg using your Kreg Jig® set for 3/4” stock and your 1 1/4” pocket hole screws and glue or 1 1/4” Screws or Galvanized Nails. The Back Rest Panels will be fastened in place flush with the inside edge of the Outer Upper Leg and should begin 1/4” from the Top of the Outer upper Leg and then be placed 1” apart after that. Construct the Arm Unit: Create your pocket holes for your arm unit, using your Kreg Jig® set for 3/4” stock and place them as shown below in the Rail (blue) and the Arms (green) at the place they will fasten to the Outer Upper Legs (this is determined by where the arm units will hit if they are perfectly perpendicular to the Front Legs). Build part of a Face Frame for the Arm Unit by using your 1 1/4” pocket hole screws and glue to fasten the Rail to the Stiles (Blue to Green). Then you will fasten the arm unit to the Outer Upper Leg. Fasten the Arm Unit to the Front Legs using 1 1/4” Screws or Galvanized Nails. Support the Arm Unit using a 1 1/2” triangular piece as shown below. Fasten it in place approximately in the Center of the Side of the Front Leg using 1 1/4” screws or Galvanized Nails. Hi there, im huge fan of your blog but this plan doesn’t seem to be functional anymore (the links are broken). The weather is nice out and i’d like to build a couple of these and the corresponding foot rests. Im sorry to trouble you but is there anyway you could email me a set of these plans? Thank you for all of your amazing work and keep it up! are you looking for the sawyer adirondack chair plans? or another set of plans? if the links aren’t working – i can fix them quickly if you leave them for me in a comment! if it is the images that aren’t working – hang tight and i will get them re-uploaded! Hi I’m having a hard time with the links. I’m really interested in creating something based on this design. Thanks! They sure are! I just need to upload them again-they got lost in the move! Stay tuned and I will get things working on just a bit!! Huge fan, Could you please get the images uploaded for this chair? I can’t seem to find them anywhere! If not you could you please email me the images? Thanks again for all the good work! What kind of software is it ? I’m looking for some soft for design a little house of wood for my daughter.